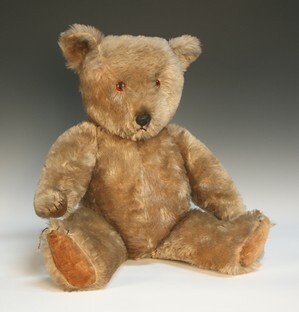 A mid-20th Century Chiltern mohair teddy bear with amber and black eyes and plastic and stitched snout, the jointed body with felt pads, height approx 61cm. 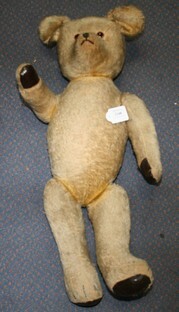 A mohair teddy bear with amber and black eyes and stitched snout and claws, the jointed body with rexine pads, height approx 62cm. 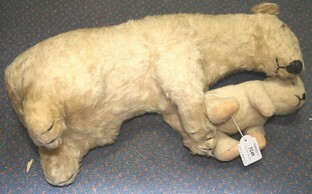 A Deans soft toy figure of a polar bear and cub, with amber and black eyes and stitched snout, height approx 49cm, and a Brumas adventure story book. 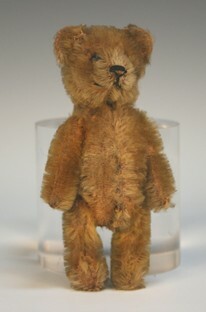 A Schuco mohair teddy bear scent bottle, the detachable head with boot button eyes and stitched snout, the jointed body containing a scent phial, height approx 12.5cm (some bald patches and wear to the left ear). 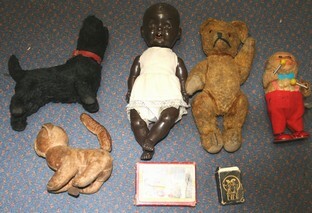 A mid-20th Century teddy bear with amber and black eyes, stitched snout and jointed body, height approx 23cm, a clockwork soft toy cat, a monkey, a dog, a doll and two sets of playing cards (playwear).